We believe skilled financial advisors can add investment value in three active strategy disciplines: asset class construction, security selection and dynamic (adaptive) allocation adjustments. Montecito Capital Management Group's focus is on the active management of multiple investment asset classes based on modern portfolio practices, relative valuations and economic/market prospects. While there are a number of effective multi-asset portfolios that have produced successful long-term results, the key to success is to find and implement a strategy that best fits a client's unique objectives, needs, and most importantly - risk tolerance. This is why we build multi-asset portfolios that align with each client's specific goals. We design client portfolios to look beyond macroeconomic headlines and seek out bright spots across multi-asset classes that stand to benefit from evolving opportunities within the global investment landscape. The merits of multi-asset investing include taking advantage of cross asset class opportunities to help in both adding return potential and managing risk. This gives investors an improved framework to think of a portfolio in its totality. And as a result, you have a total objective for the pool of assets. We also emphasize that the understanding of risks embedded in a portfolio is central to providing value to our clients. It is our philosophy to build diverse, multi-asset portfolios in an effort to capture long-term positive returns while having resilient portfolios that may help weather future volatility. We think of investing in terms of probabilities instead of binary outcomes. We subscribe to legendary investor, Warren Buffett's mantra, "We don’t have to be smarter than the rest. We have to be more disciplined than the rest.” Indeed, investing is not about timing the market tops or bottoms, but rather it is more about understanding and acting on knowledge of whether or not there are more positive investment opportunities in the market than they are negative opportunities, then allocating within that risk-reward framework. The basic principles in which we apply to manage financial assets is to never over concentrate allocations to any one investment, only hold those investments that offer either the prospect of a reasonable return (or diversify-mitigate risk) and accept that financial markets can behave in ways that confounds the majority of investors. These principles are guided by the importance of portfolio diversification, maintaining reasonable expectations and avoiding the latest fads. We employ asset diversification strategies to manage risk, but this does not guarantee against loss - rather, it is designed to help mitigate the magnitude of potential losses. Investors need to understand and accept the reality that there is a trade-off between the level of portfolio growth, income and risk. We subscribe to managing dynamic factor exposures while still delivering broadly diversified, economically representative portfolios. Our portfolios employ passive (low cost) investments together with active management strategies, including the value-added selection of individual stocks and bonds. We believe portfolios should include asset classes that react differently to different economic environments, with a diverse mix of holdings to help insulate portfolios from unexpected negative market events. Asset classes should be distinct, clearly defined and offer specific benefits to portfolios. We apply different types of investment asset classes, each playing a specific role: longer-term return performers, shorter-term risk reducers, hybrid investments (which may have a combination of both return generators and risk reducers), and diversifying alternative strategies. We evaluate asset classes by focusing on three characteristics: return, risk and correlation. Utilizing these three primary characteristics as a basis for evaluating asset class portfolio benefits provides a framework to deal with the inevitable trade-offs in selecting asset classes. A sampling of asset classes may include domestic & international stocks, preferred stocks, diverse types of domestic & international bonds, convertibles, REITs, liquid commodities, liquid precious metals, MLPs, liquid timber/farming, a number of alternative strategies and so forth. This is why advisors need to think in a qualitative way about what the future may hold for different types of investments, how different asset classes may be impacted by that forecast, how it will affect the investor and how to invest in light of these forward looking views. A value-added advisor should not only be actively strategizing and taking diligent portfolio actions to maximize your potential gains based on current economic and capital market prospects, but also seek to protect your capital from downside risk. After all, it is a well known fact that the global economies, markets and risks are not homogenous and experience upward and downward cycles. By the same token, shouldn’t your advisor then adjust your portfolio to have the greatest probability to benefit from the heterogeneous cycles that often extend for periods of years? Yes, adjustments should be made to place your portfolio in a position to have the greatest opportunity of success given the current investment environment. As long-term investors we consider short-term price volatility as an opportunity and high price valuations as risk. For those clients that choose more aggressive portfolios, investment outcomes become less predictable. Also, well-performing asset categories will come to represent a larger percentage of your overall portfolio than originally planned - which can increase your overall risk. To counteract this, we periodically rebalance our non-discretionary client portfolios to bring investments back to the target allocation and to assure that portfolios remain well-diversified. Any rebalancing of your portfolio is done in a way that's designed to minimize taxes and transaction costs. With this portfolio application, diversification means strength through variety. If each component of a portfolio does the same thing, then the portfolio is no stronger than any one component. Indeed, not all elements of a portfolio are going to be performing the same, nor should they. That reflects the concepts of having strategy and asset-class diversification in place, risk management and good defensive planning. Moreover, this should be applied while continuing to review the markets for opportunities to make strategic adjustments in our clients' portfolios based on ever-changing market developments. Most investment advisors are not portfolio managers. For all intents and purposes, a large body of financial advisors profess the success of a buy-and-hold investment strategy and do not actively manage your assets. However, if you are retired or are near retirement, a well thought out portfolio adjustment plan and sell discipline becomes all the more important. Your nest egg is likely a great source of your retirement livelihood and your financial advisor has based “average annual” returns on much longer time-horizons that are positive for the rest of your retirement - this is complacency management (not active) and is pure speculation. Upon retirement you will likely begin taking income from your retirement portfolio based on your needs and what your adviser believes to prudent. This “reverse dollar-cost averaging” often occurs when you no longer have the luxury of a long-term investment horizon. The most important risk in your portfolio is time, particularly the decay of opportunities for a greater total return, or more time to recover from a potential market loss as you hit your golden years. Many advisors also offer misleading facts, such as “if you miss the 10 best days of the stock market over 30 years you would actually have negative returns.” This is true, however, it is a one sided argument, and fails to consider “what if I miss the 10 worst days?” One study shows missing the 10 worst days more than triples a buy and hold strategy, however both arguments are flawed and misleading. For example, if you started investing in 1963, you would find that at the end of 1983 you had less money than you started with 20 years later. The point being is you need a long-term investment plan in place with a discipline strategy to make the outcome for your portfolio meet your own specific goals - and you should avoid these types of "what ifs". Former NBA rebounder Antonio Davis once said, "It's a fool's gold if you are winning games and are not playing the right way." Within the lenses of investing, 'playing the game right' would translate into an investor having a defined, thoughtful process to increase the likelihood of long-term positive portfolio outcomes, even though in the short run a good disciplined process can fall flat. As one investment leader puts it (Gibson), ‘the multiple-asset class strategy is a tortoise-and-hare story. Over any one-year, three-year or intermediate-term period, the race will probably be led by one of the component single-asset classes. The leader will, of course, attract the attention. The tortoise never runs as fast as many of the hares around it. But it does run faster on average than the majority of its components, a fact that becomes lost due to the attention-getting pace of different lead rabbits during various legs of the race... Yet the tortoise, in the long run, leaves the pack behind. And in case the analogy was lost on anyone, the hare is the single-asset class domestic (high growth) stocks, for instance - whereas the multiple-asset class is the tortoise.’ When stocks lost value in the most recent 2000-2002 and 2008-2009 bear markets, retirees with properly diversified assets - including a few years of future income set aside in maturing bonds - weren't forced to sell shares at those levels. Having a multiple-asset portfolio affords one to have the option of patience with a goal of making negative market events someone else's problem. Portfolio diversification may help reduce risk, and the lower the correlation between returns from different securities in a portfolio, the greater the diversification benefit. Thus, successful diversification depends upon combining asset classes that are not perfectly correlated. Experience has taught most investment professionals that the only way to make realistic gains while capping losses is to have a diversified portfolio, with asset allocation as a cardinal principle. To lower portfolio expenses, we also utilize individual stocks, individual bonds and exchange-traded funds for a portion of the pure equity and fixed income classes, then apply macro and fundamental analysis to overweight countries, sectors or yield curve segments. However, the methodology of using passive, lowest cost exchange traded solutions must be executed with prudence. We deem the blind use of ETF passive benchmarks to be inherently dangerous since engaging in 'herd behavior' often leads to holdings of the most 'trendy' companies, which may have absurd market values relative to the intrinsic fundamental value. Finally, increased volatility, limited growth opportunities and a low-return fixed income environment are just a few of the reasons advisors have been adding more alternative assets (e.g. REITs, option protection, absolute strategies, etc.) into portfolios. Another reason advisors are also including some liquid tradable alternative strategies in their clients’ portfolios is that they broaden diversification and give investors a risk/return profile different from that provided by equities, bonds or cash. Flexibility to use modern investment tools enable managers to go beyond traditional methods of obtaining exposure to more diverse markets for active alpha opportunities. Adding a broader range of different investments to more conventional investments can diversify the sources of return that improve performance relative to risk, while also creating opportunities for more efficient portfolios. As markets evolve, absolute return strategies can adapt with them. We look at alternatives as portfolio diversifiers because they don’t have a high correlation with stocks or bonds and fit somewhere between the two in terms of risk profile. Another consideration is to evaluate the increased portfolio contribution of liquid alternative assets when traditional assets like stocks and bonds are trading at lofty valuations. The other benefits of alternative assets is the potential for higher returns with same risk when added to a traditional portfolio, or lower risk with the same target return. See graph below. Again, we aim to help offset the higher costs of alternative styles with dynamic passive securities via exchange traded funds or ETF (average expense 0.15%-0.35% or 15-35 basis points), along with buying individual stocks, diverse individual bonds, preferred issues, etc. With ETFs, we can choose between over 100 styles of ETF equity indices (focus on liquidity) and construct a portfolio that integrates a low-covariance between classes. We further optimize mean-variance with fixed income (TIPS, Corporate & Government bonds) and hybrid fixed income exposure (convertible, high-yield & mezzanine debt). So we’re emphasizing using various alternative strategies to help us manage risk. 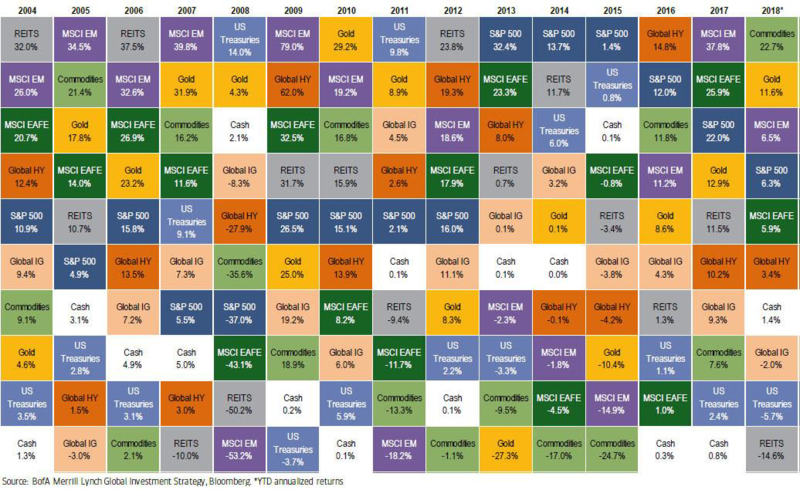 What is revealing about the top chart "Total Returns by Asset Class Rankings" is the asset-type performance leaders change and in any given year, some asset classes will outperform another. Unfortunately, no amount of skill or experience has enabled anyone to forecast how exactly various asset classes will stack up in any of those given years. And as a result, while we may overweight and underweight asset classes based on the prospects given the prospective investment environment, those who try to time the markets usually underperform. On its own, each asset class can be quite volatile, but a mix of assets in a balanced portfolio can lower overall volatility. The key is to diversify across asset classes that behave differently across economic environments. In general, equities do well in high growth and low inflation environments, bonds do well in deflationary or recessionary environments, and commodities/hard assets tend to perform best during inflationary environments. We focus on having a balanced exposure to these three main principles in order to produce more consistent long-term results, which at times, may hold different assets during different economic cycles. The following graph illustrates return relative to risk, in the form of standard deviation. 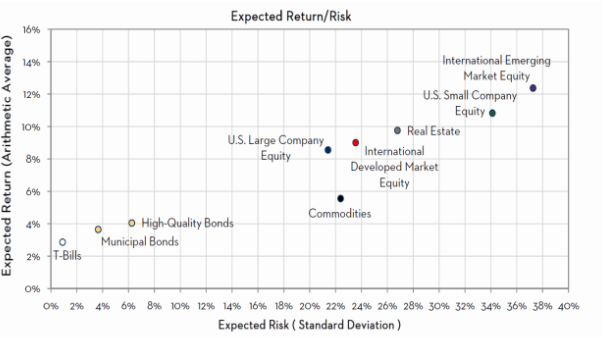 Within a two asset world of stocks and bonds, there is a tradeoff between return and risk, which each unique client may fall within for the optimal portfolio allocation. The difference is we work with many more diverse asset classes. 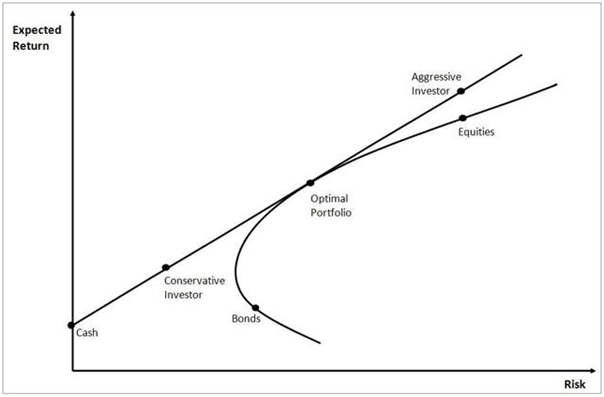 The same principle is applied within a diverse multi-asset framework, having an optimal combination of many different asset classes with their own unique historical returns and risks. 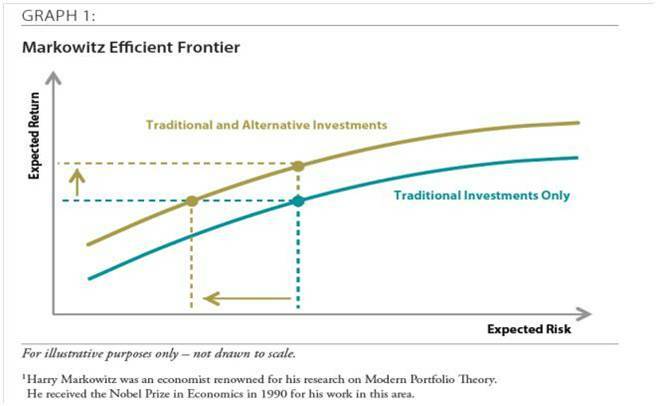 For example, the following displayed assets would be applied to the optimal portfolio allocation frontier shown in the above illustration. There's an old adage in investment finance: "Do you want to be right, or do you want to make money?" If you're in the punditry business then all that matters is saying "you were right," while often overlooking all the times you were wrong. Successfully managing money is different. We are not oracles, nor do we have a crystal ball, but we do have tools to help manage investment allocations: economic data, valuations, fed policy and guidance, global stability, etc. Hence, rather than attempting "to be right," we focus on reasonable portfolio returns and believe it's far﻿ more efficient to mitigate risk with diverse asset classes. As an institutional custody affiliate of Charles Schwab, our services provide for full transparency, 24/7 online client access, safe asset custody, third-party statement reporting and a low fee-oriented platform. Disclaimer: The website provides general information regarding our business along with access to additional investment related information. Material presented on this website is believed to be from reliable sources and is meant for informational purposes only. The intent is to provide helpful information, which should NOT be construed as investment advice. We do not guarantee its accuracy, nor completeness, and it is not intended to be the primary basis for investment decisions. We do not make personal investment recommendations to people or entities except to those who have engaged us expressly for the purpose of providing professional investment advisory services. Investing involves risk and possible loss of principal capital. Montecito Capital Management Group’s ADV filing is available online at http://www.adviserinfo.sec.gov and current FORM ADV Part 2, which describes the services offered, fees charged and detailed company information, among other things, is available upon request free of charge. We are limited in our fiduciary capacity by the firm's non-discretionary client relationship, whereby the client dictates the investment parameters and contractually agrees to accept sole responsibility for their choices.